Today is all about fringe! 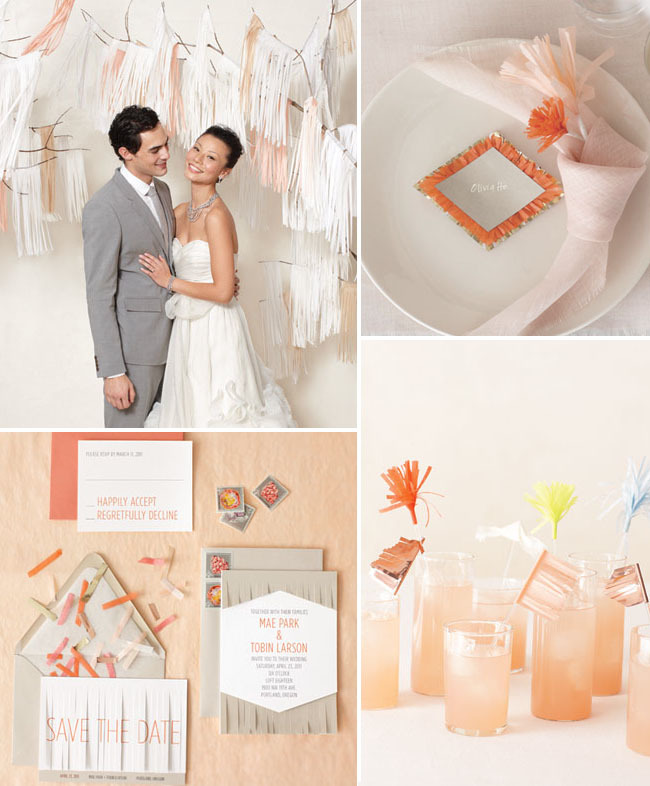 I’ve been loving the fringe trend for awhile now and wanted to share some fun wedding ideas for your day today. We even put together two totally unique fringe DIYs we’ll be sharing later today so be sure to check back. What do you guys think – anyone out incorporating fringe into their day and how are you doing it? When talking about fringe, you have to mention confetti system! They design lots of great installations and projects with fringe. 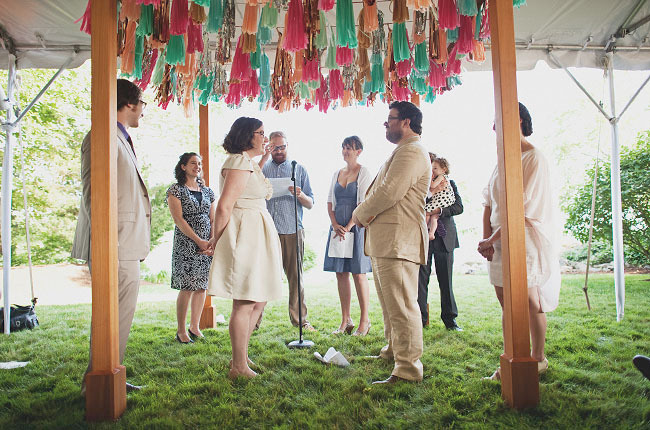 This couple below purchased some designs by confetti system and used them as the perfect ceremony backdrop – how adorably fun is that?! Wedding photo below from this wedding by The Image is Found. 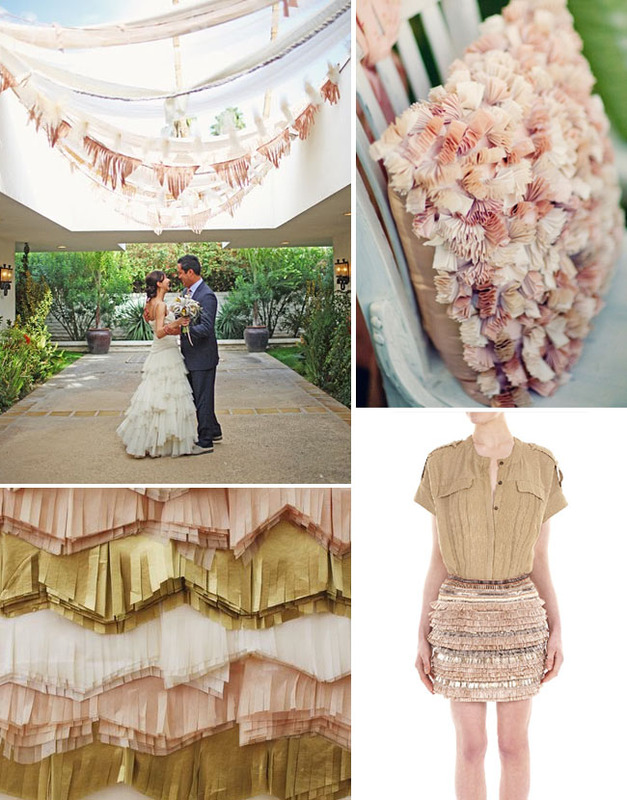 And if you haven’t seen the current summer issue of Martha Stewart Weddings – they even collaborated with confetti system to come up with some fun ideas using fringe for your wedding. Super cute! Be sure to check back in a bit for our first Fringe DIY of the day – super cute and easy to make for your wedding! Love this! Especially those fun swizzle sticks. I’m sure they’d be easy to DIY! the pillow is too cute! This is FRINGEing awesome! Love the texture it adds!! Fringey! I especially love that dress, I didn’t know you could do that with fringe~ It looks elegant but playful! i do, i do, i do LOVE your site. i have featured it and suggested every (female) i know to follow it. the amazing photographers and talented wedding parties make me want to a plan one for myself on a daily basis. as i was reading this post, i thought i needed to send it to my friend julie ho and then you featured her amazing company confetti system! again, i can not over emphasize what an inspiration your site has been especially as i building my own. Gorgeous post! These are such fun inspiration images.